Welcome to the Office Dogs Project, a photography project celebrating ‘canine cohorts’ in offices and workplaces. First day at work for bulldog puppy. wily animals milling about? A dream workplace for any pet lover. If you are here, it means you find the concept of dog-friendly workplaces compelling, interesting or exciting in some way. Perhaps you are one of the lucky few who get to work with your ‘furkids’, or you are among the many who wish you could work with your pets. This ongoing personal photography project is a deep-dive into the world of ‘pet-friendly workplaces’. A peek behind the curtain to see what really goes on when you have canines circling the water coolers, felines ruling the break rooms, and dog BFFs playing ‘bitey-face’ during conference calls. Recess on the ‘doggie deck’. 17th floor of Doppler building at Amazon’s Seattle HQ. First- a brief introduction, for those who are new to either the project, and/or my business and blog. In this post I’ll go through the ‘who’, ‘what’, ‘when’, ‘where’, ‘why’ and ‘how’ of the project. 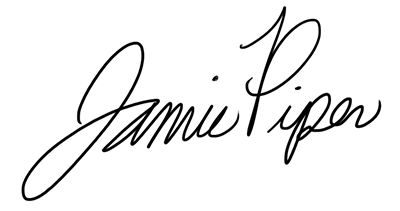 My name is Jamie Piper, and I’m a commercial animal photographer based in San Diego California. I own Cowbelly Photography, a business I launched in Seattle in 2003. I create images of dogs, cats, and people with animals, for commercial and editorial clients, as well as provide stock images to publishers. My clients include Pedigree, PetSafe, Nutro, Frontline, Purina, Freshpet, Workman Publishing, Brilliance Publishing and more. 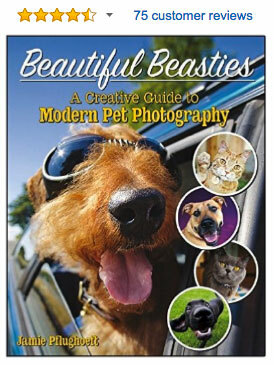 I also wrote a reference book on pet photography. You can follow me on Instagram here: @cowbelly. Facebook here. Twitter here. 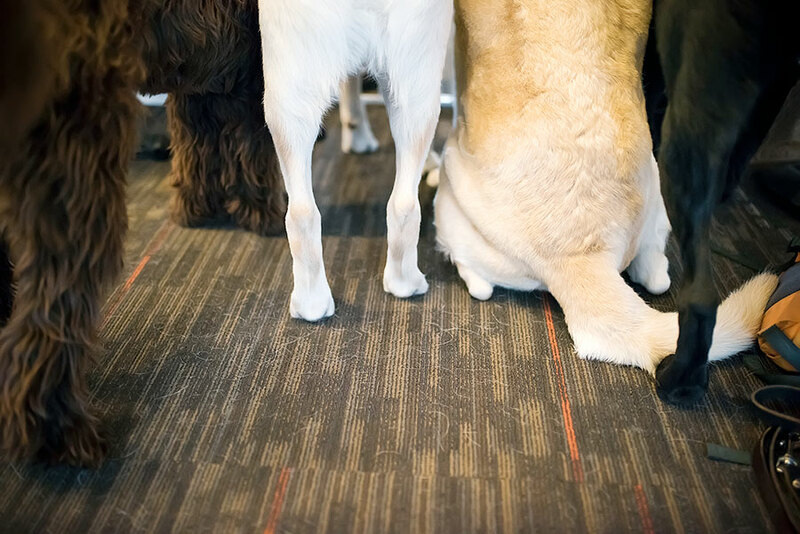 Office dogs’ backside waiting for a lunchtime walk. 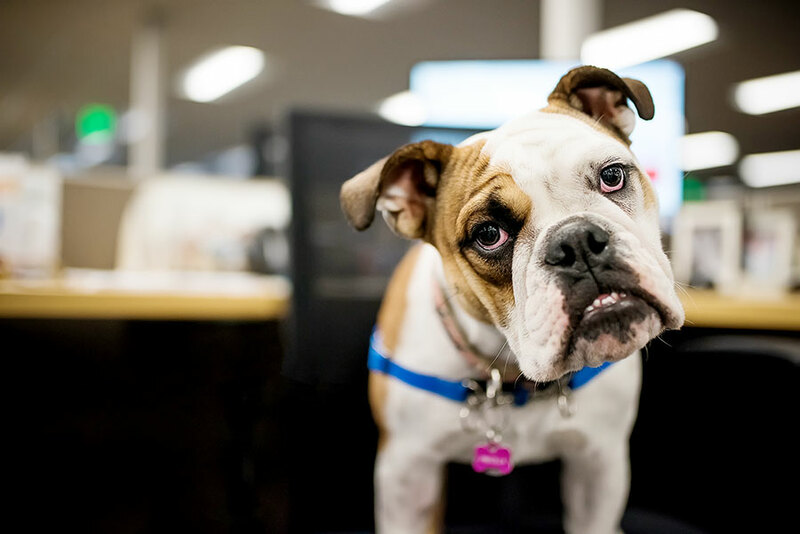 A personal photography project that captures ‘dog employees’ at work in offices and other workplaces. I also include the brave cats and other animals that hang out in offices with dogs. Although the project is called ‘The Office Dogs’ Photography Project, I don’t discriminate against any kind of animal that goes to work with their owner, and will happily photograph any pot-bellied pigs, iguanas, kittens and other animals I come across. In addition to the photography, I interview each company about what it’s like to be pet-friendly, what challenges they had becoming pet-friendly, funny stories and other interesting information. I started doing the shoots in October 2016, and started publishing them in February 2017. This is an ongoing personal project. I’ll shoot when and where I can and post photos whenever I have the opportunity. I imagine I’ll do other personal projects along the way as well. If you want to be notified when I publish new images, sign up for my mailing list. I also have a larger gallery of photos from each company on my website under The Office Dogs Project. A variety of different companies/businesses, from pet-centric service and/or product companies to tech companies and everything in between. Starting in Seattle, then San Diego, then Los Angeles and San Francisco, time and shooting schedule permitting. 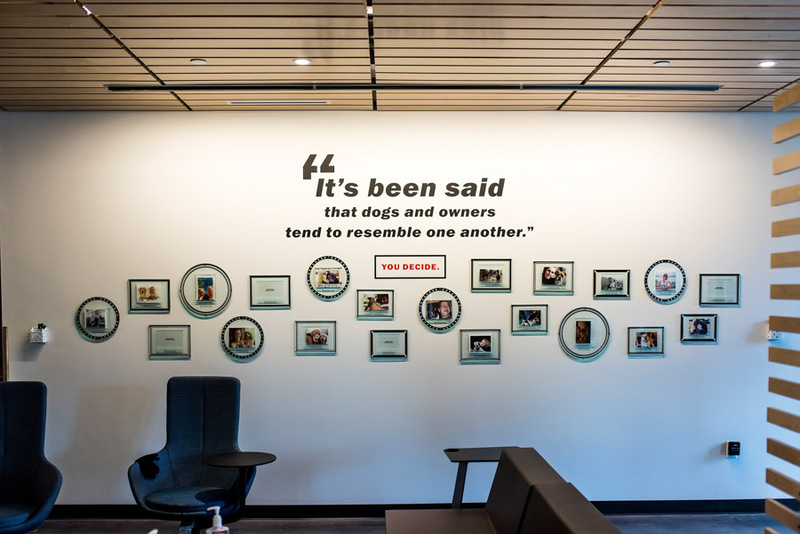 Amazon’s ‘dog + owner’ photo wall at their Seattle Doppler building. Just me, one camera body (Nikon D810), and one lens (Sigma 35mm f/1.4 Art). Just me and my camera, photographing dog ’employees’ at work, being as quiet and unobtrusive as I can possibly be while army-crawling on the floor under a stranger’s desk. This project is entirely self-directed and self-funded. Any limitations are due to my own time and budget. Getting some love during a work break. To stretch my creative muscles, experiment, try something new and challenge myself in a way that I often can’t on commissioned shoots. If you clicked on one of the links above to check out my work, you can see that it’s bright and colorful and engaging, and has a thread of humor woven through it. I am usually interacting with my subjects and getting them engaged with me, and (by default) my camera. In contrast, the Office Dogs Project is filled with photojournalistic-style, ‘fly-on-the-wall’ images where I am intentionally not interacting with my subjects. It’s very different from how I normally work, and it’s actually quite difficult to get the dogs to ignore me, mostly because I love them so much. I’m in the very lucky (small) group of people who get to work with their dog every day. I have had this luxury for the past 11 years, and I can’t imagine having a job where I could’t have my constant companion by my side. It is my sincere wish for all companies who are interested in becoming pet-friendly to do so, to provide this incredible benefit to their employees. To see how rewarding, fulfilling, and even life-changing this perk can be for their employees, and how much it can improve on a company’s bottom line. Collective research from multiple sources has shown that employee retention rates are higher, employees work longer hours, and are more focused when they have their dog at work with them. And people are healthier and happier in general with a pet in their midst. Teams also work better together, and communication is improved when there is a dog around. 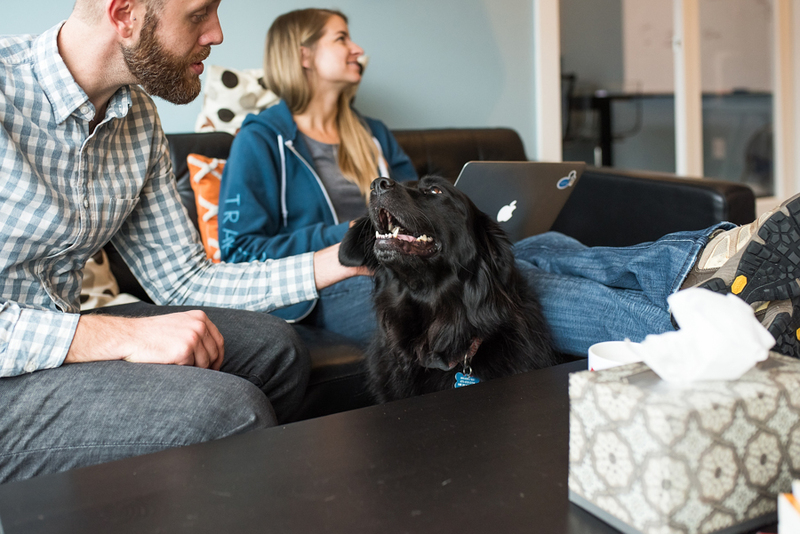 Having ‘dog-friendly’ as a perk is also a great way to attract top talent when hiring. All pretty significant benefits to a company’s bottom line, and all compelling reasons to bite the dog-friendly bullet and go for it. 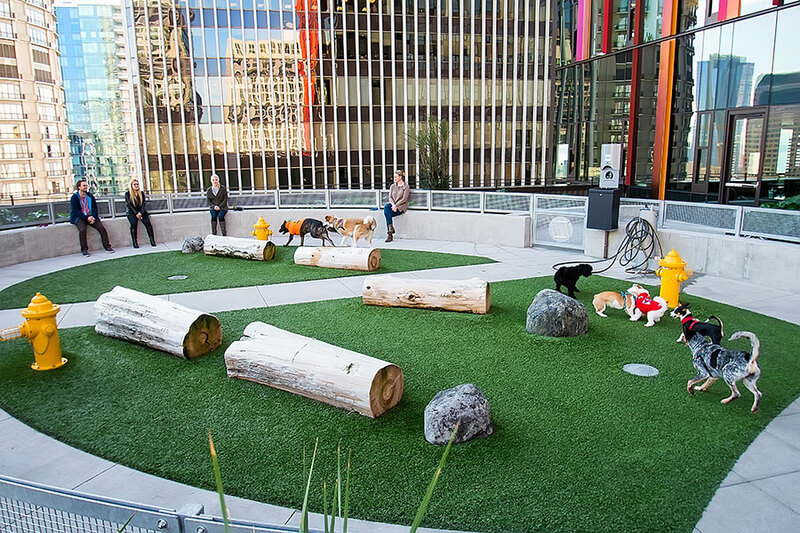 If this photography project in any way helps influence the decision of any company to create a pet-friendly workplace, then I consider it a rousing success. Frenchie canine cohort getting a midday head scratch from his dad.